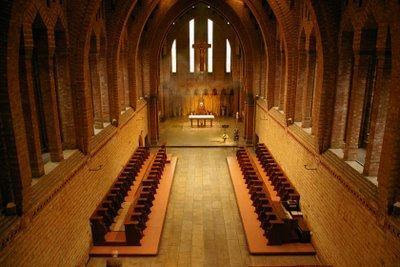 My last posting was about a monastic chant forum at Quarr Abbey on the Isle of Wight, which of course I encourage you again to attend! This reminded my of my own visits to Quarr in the years just after my conversion. On my first visit, I spent an afternoon with Fr Joe, who was made famous after his death in 1998 by the book written about him by Tony Hendra. 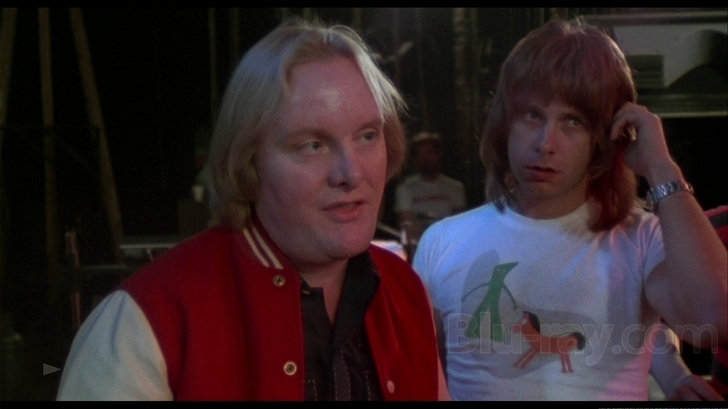 Hendra is a British comedy producer and actor known on both sides of the Atlantic for his work on, for example, the British program Spitting Image, the American program Saturday Night Live, and for the part that I knew him for, playing rock-band manager Ian Faith in one of my favorite movies of all time, This is Spinal Tap. 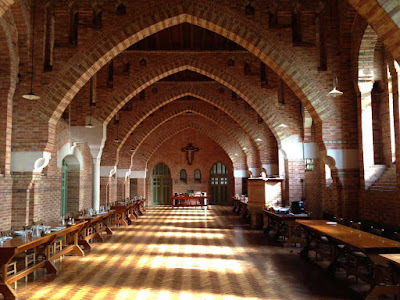 With Quarr on my mind, I thought I would relate my own experience of meeting Fr Joe there; he made an such an impact on me that I would often tell the story of meeting “a monk at Quarr” even before Tony Hendra wrote about him. 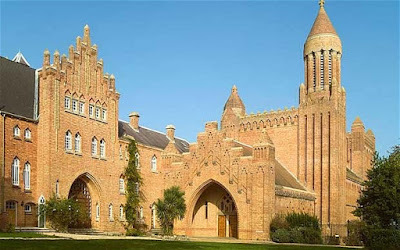 When I lived in London in the 1990s, a priest at the Brompton Oratory encouraged me to go on a retreat at Quarr Abbey. I think he suggested it as a way to develop the contemplative side of my spiritual life, and because he thought that perhaps I might have vocation to the religious life. So I duly went down to the Isle of Wight to experience a Benedictine monastery for the first time. Fr Ronald, the Oratorian asked me to “Say hello to Fr Joe” for him when I was there. 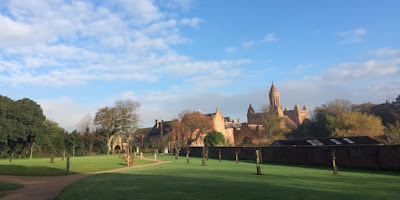 I found my first visit to a monastic community strange; it was so other-worldly that I didn’t particularly take to it on the first occasion. It was only later that I started to love the chanting of the psalms. What I found strange was the way that as a guest, I didn’t seem to have any contact with the residents. I saw the monks at meals, but we weren’t allowed to talk, and in any event sat at separate tables. When I did see any of them walking around the grounds, they would put their heads down and avoid eye contact. It wasn’t until I read the Rule of St Benedict that I understood that in order to promote humility, they generally do not initiate conversations with guests, and will only speak to them if spoken to first. Eventually in frustration, I just approached one of them and said I had a message for Fr Joe: “Fr Ronald says ‘Hello.’ ” The monk I approached came to life and thanked me for the message, and asked if I would like to meet Fr Joe myself and give him the message personally. Hesitantly I said yes; I wasn’t sure what I would say to him after those few words. 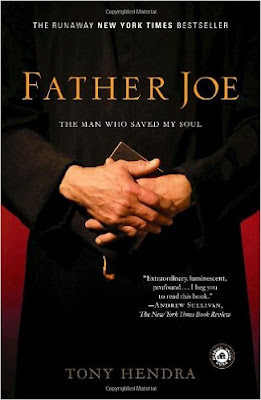 So I was shown up to his room and handed a large cup of coffee, as the monk who showed me the way ushered me into Fr Joe’s cell. 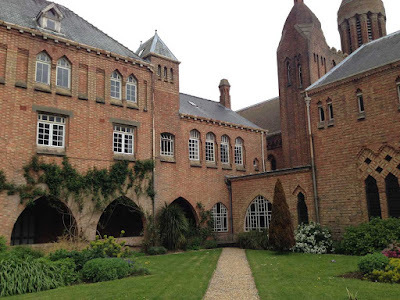 Fr Joe himself was sitting up in bed next to a window with a view of the grounds and the sea. I thought I had been told that he was recovering from a stroke. I didn’t think about it at the time, but he had a large padded white patch taped over one eye, which wouldn’t have indicated a stroke. I found out from the book many years later that he had cancer of the sinuses, and it was extremely painful because the tumor was pushing one of his eyeballs out of its socket from behind. Despite the pain he must have been going through, he called me over, and I was struck by how cheerful he was. With a broad smile he asked me to sit close to him. I did so and then he looked at me, his one visible eye twinkling, waiting to hear what I had to say. I passed on the message. Then he started to ask me all sorts of questions about how I knew Fr Ronald, and told me a bit about himself. I am sketchy on the precise details, but as I remember it, he told me that he had lived in the monastery since he was 17 years old, and was then 90, so he had lived there seventy-three years. In those days, I couldn’t imagine remaining sane by leading a life where I had nothing to do for seventy years apart from singing, eating and tending the vegetable patch. If anything, I felt sorry for him. The only reason that he could be so cheerful, I thought, was that he had never had any experience of the sort of things that really make like worth living, most of which hadn’t even been invented when he left the world. He asked me what I did for a living. I remember hesitating, and thinking that he must be so far from worldly things that I didn’t know if he would have any idea what my life could possibly be like. I wondered if I might even have to explain what a job was, never mind what mine as a recruitment consultant entailed. Nevertheless I told him, and he listened and nodded as I gave him various details and seemed to understand. Then he asked me if I had any problems. I was going through girlfriend difficulties at the time and rather vaguely indicated this, expecting him to take the conversation no further, as his lack of personal experience would mean that he was unable to make any comment. To my surprise, he not only had some comments to make, but asked me some very pointed questions about my personal conduct. I remember thinking, how do you know about that sort of thing? Because of his warm manner and deep and genuine interest in me, I found myself revealing very personal thoughts and conduct. It struck me later how quickly he had put me at ease and gained my confidence. After the questions, he then gave me some advice about what to do. I wish I could remember the details, but I can’t. What I can remember is that what he suggested was so simple and on-the-money that it was obvious, to me at any rate, that it was right. I know that I did resolve to follow his advice. At a certain point, perhaps after about 20 minutes or so with him, he apologized and said that he had to let me go because he was about to receive some treatment. But he as he did so he encouraged me to visit and come and see him again. 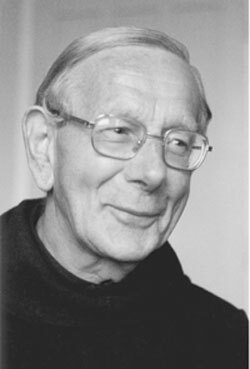 When I returned to London I told a friend of mine, David Birtwistle, all about Fr Joe, and how amazed I was at his wisdom, given his total lack of experience of the things he was commenting on. 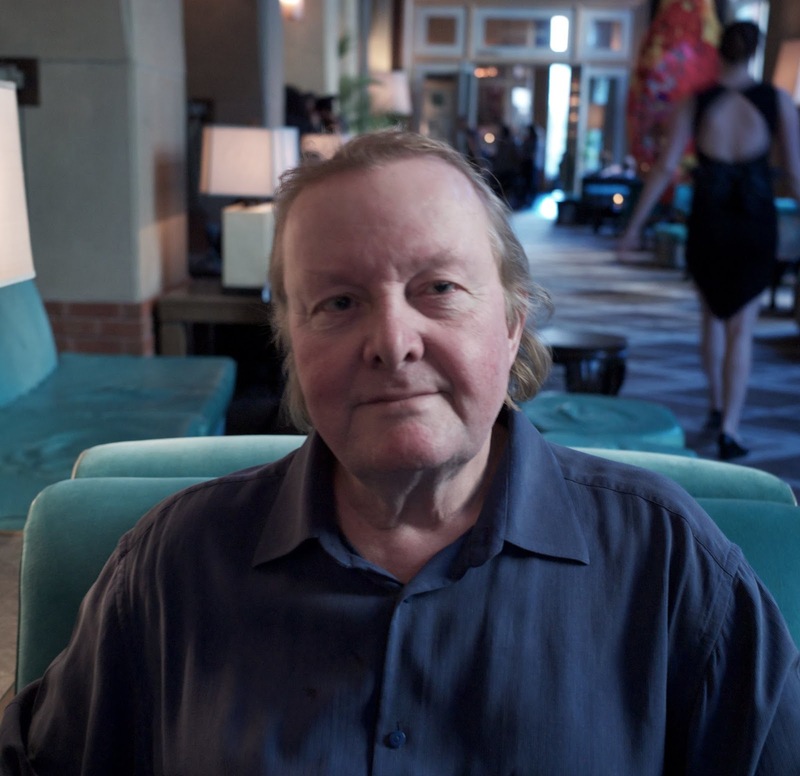 David was my mentor, an artist and a Catholic, who had drawn me to Catholicism when I was a bitter atheist; he was also my sponsor when I was received into the Church. 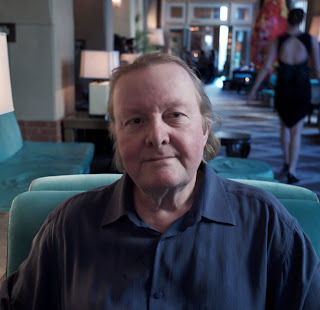 David was, to my mind, as wise as Fr Joe; it was he, for example, who took me through a set of spiritual exercises that allowed me to discern my personal vocation and become an artist, I wrote about it here. So when I described the meeting to him, David said something profound to me, and it was his comment, as much as the meeting with Fr Joe itself, that I would relate whenever I spoke of this in the following years. David said, “Well doesn't that tell you something? Fr Joe is close to God. Because God is the Truth, those who have a relationship with God have a grasp of truth, and understand what it means to be in relationship more profoundly than if they relied solely on experience of human relationships.” This was true. I learned from Hendra’s book that many other people were drawn to Fr Joe, and so, in addition to the way that David described, he would have learned things about many aspects of the secular life by listening to so many people speaking about their experiences and difficulties. Furthermore, the monastic community is a place, I now realize, where people experience human relationships intensely, and again, Fr Joe will have learnt from this. Nevertheless, what enabled him to offer insights into my situation so well, I believe, was exactly what David had put his finger on: divine wisdom. I would often relate this story in response to an argument often used by Protestants against priestly celibacy, that single priests can’t offer advice on relationships because they have no experience of marriage. Aside from the fact that the primary role of the priest is to minister the Sacraments, and not to act as a marriage and guidance counselors, Fr Joe demonstrated to me that personal experience is neither the only nor the greatest source of wisdom. As another facet to this story, David never told me that he also knew Fr Joe personally. He had spent a period discerning a religious vocation himself, and had spent several months at Quarr Abbey in the late 1940s. David is now dead too; he died about the same time as Fr Joe, when he was 70 years old. Even though I would not have said at the time that I particularly enjoyed my first visit to Quarr, I found myself thinking of Fr Joe, the beautiful setting and the chant more and more in the following months. I decided to go back, and my intention was to see Fr Joe again, but by the time I got there, he had gone. He had died just a few days before, and there was a huge display flowers and wreaths with dozens and dozens of cards. Now, fast-forward to a conversation I was having with a parent of one of the students at Thomas More College about 5 years ago. He was telling me about this amazing book he had just read - the Hendra book - about a wise monk at an abbey on the Isle of Wight in England. Gradually, I realized that he was talking about Quarr Abbey, and I assumed that he must be talking about the same Fr Joe that I had met. I immediately went out and bought the book and realized that it was. As I read Tony Hendra’s book and his descriptions of the abbey, of the grounds and of Fr Joe and his conversations with him, it not only reinforced memories, it gave me a lot more detail about the man than I had ever known. All of it supported my friend David’s assessment of him, as one who was close to God. It also struck me that there is a lesson here on how to be an evangelist. Here was a man who lived in one place for pretty much the whole of his life, never wrote an article, or gave a TV interview in his life, yet the Holy Spirit brought people to him and he affected them profoundly. It is just as Pope Benedict described in his little paper on the New Evangelization. The method of the Evangelist is prayer....I wonder if Cardinal Ratzinger ever met Fr Joe? It wouldn’t surprise me.